Our plans to move to Ft. Bliss in the end of January as a family fell apart. Our young children (ages 2 and 4) and I (eight months pregnant) would be staying in Michigan. Previous National Guard drills and training would pale in comparison to this new journey that we were embarking on. The next six months held many unknowns. I was scared. I was clueless about the Army, it's structure, and my husband's role as an Army chaplain. Once my husband left, I embarked on the challenging journey of holding down the home front. I listened to my children ask for their daddy to come back on the airplane. When they were tired or naughty they cried, "I want my daddy." I had my own worries for my husband's safety; the invasion into Iraq had concerns of chemical warfare and so many other unknowns. When it came time to give birth to my daughter, there was a moment when my bravery dissolved. Raising a young family of three on my own, preparing our house for sale, worrying about my husband's safety...it was not easy. "Don't worry about us. We are being more than well provided for..."
But looking back, these words I wrote to my husband as we said our e-mail goodbyes on the eve of the invasion into Iraq, they truly captured my first deployment experience. I was well cared for...our church, family, friends...they rallied around us. It was a beautiful thing that carried me through. I have no neatly organized binder of e-mails exchanged between my husband and I for this next deployment that spanned from 2005 to 2006. No neatly cropped photos or newspaper clippings to document it like our first. 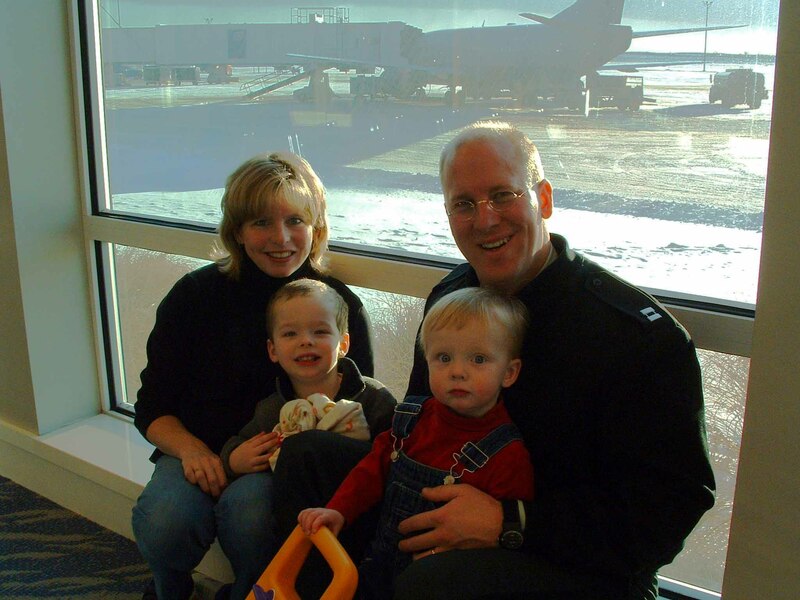 Our young family (now ages 2, 4 and 6) returned to West Michigan for a second deployment - one year to Qatar and Afghanistan. I began confident. I had done this before, I was a Christian, a chaplain's spouse at that...piece of cake. I was going to be the model of a successful deployment. God had watched over us last time. My faith was strong. Whatever came our way, it would be okay. After all, this community my husband returned us to--they wrote the book on caring. The morning my husband left Grand Rapids International Airport again, the kids and I returned to our driveway littered with tornado-like remnants of his last minute packing. I dove into volunteering at our church, re-connected with old friends and tried to find my niche for this season. I had many offers for help, and I was grateful. But as the months went on, my energy waned. I relished the late peaceful nights when the kids were in bed, but dragged throughout the day. I smiled, I kept on smiling, trying to at least convince myself that I really was okay. As the days turned to months I experienced moments and minutes that felt like days and years. My support network dwindled out of existence, carried away by the cold Michigan winds, and I was left alone to trudge through the most dreary, unhappy time of my life. On the outside I looked like I had it together. I functioned, but I was far from flourishing. Worse, I felt awful for my kids. I could barely carry the load of both parents and have any leftover for loving and cherishing them. I yearned for people to love on them, to make their days bright. Didn't anyone reach out and help? Yes. We did receive some help, some love, some caring, and I am so thankful for those individuals who stepped forward. But it was not enough. I certainly didn't want to be a project of sympathy. I didn't know who to turn to for help. And any small cry for help that I was able to utter fell upon deaf ears. It was tempting to turn my back on those that loved and cared about us. Where were they? My husband returned to a standing ovation upon his return to our church. I sat in the back row with our young children. No one acknowledged my pain, my sacrifice, my service as a military spouse. No one knew what I had been through, how I felt abandoned and how much I hurt. It felt like no one cared. new chapter at Fort Knox. They did not understand the hardship of deployment...what I was going through. If they wanted to help, they didn't know where to begin, and I'll confess, sometimes I didn't know what I needed either. My jaw dropped at our military wives' Bible study (Protestant Women of the Chapel) one day. A wife shared that she had stopped going to church since her church wasn't there for her during her last deployment. It was a huge revelation to me. I wasn't the only spouse who struggled. As time unfolded I continued to hear stories and I learned my experiences were not isolated. Yellow ribbon bumper stickers and patriotism in support of the troops was plentiful, but who was caring for the spouses and children at home? It has been said that sometimes you are God's answer to your own prayer. I approached various organizations about the need for military family support. None responded. So, as the Fort Knox chapter of our lives drew to a close in the summer of 2008, I had a name, Operation We Are Here, and the small beginnings (five pages) of a website. myself to work on this, and then the website will be done." of my spare time into the continued development of Operation We Are Here (OWAH). With no training in website development or social media and with strong leanings of introvertedness, it has been a humbling, exhilariting, and courageous journey. Frustrated with knowing what the site needed to look like and taking forever to get there, many times I've wanted to quit. Because I believe God called me to create this website, I continued to press on. "resources in one location that is easily navigated." Added to that was, with the assistance of Beth Allen of Troops in Touch TM, the development of deployment resources for my own children during my husband's third deployment, Brat Town Bugle TM and Flat Brat TM. It is my hope and prayer that the gap between the civilians and the military would be lessened as a result of Operation We Are Here. I hope that our friends, family, neighbors, co-workers, and others would be left with no excuses and ideas in how to begin to put their support into action. In December of 2002 my husband left his position as an assistant pastor of our home church in West Michigan to become an active duty army chaplain. Weeks later as we were enjoying holiday celebrations with family and friends, we received the call that ten days following his arrival at Ft. Bliss, TX, he would be departing for Kuwait.